Hello and why don’t you do a salad bowl dive? In what is perhaps the most shocking plot twist of this four-day old year so far is that I’m not just eating kale salad because the year is only four days old. For once, I’m not being a total cliché… well, at least not THAT much of a total cliché. If you follow me on snapchat or instagram, then you know that we’ve been eating these huge kale salads at least once – and sometimes twice! – a week for a few months. With my absolute favorite and the one that sealed the deal for Eddie, being this one. Greek yogurt Caesar kale salad. At this point I could probably make it with my eyes closed. Two salads come to mind when I think of the salads that made me be okay with eating salads. You know what I mean. Like actually eating salads and enjoying them and loving them and not wishing there could be some magic voodoo explosion that turns your lettuce and shredded carrot bag mix into a bacon cheeseburger or pizza slice come 12:30 on every Monday. But definitely not Thursday. Or Friday. Because at that point, you’ve caved into a club sandwich or cheese quesadilla or even just extra cream, sugar and maybe even mocha in your coffee because Thursday technically MEANS it’s the weekend when nothing you ingest counts towards your caloric goals, unless it’s a green smoothie or egg white omelet. But those salads. The first one is a BBQ salmon salad that I love to toss with butter lettuce and feta and crispy chickpeas and roasted red peppers. Any salmon in a salad is a win for me because if cooked properly, it flakes all over the place in a huge flavor bomb and is insanely delicious. The second one is your run of the mill taco salad. I don’t mean the taco salad made with crushed doritos (aka, the only time in my life that I EVER like doritos), but the salad you may make at home with crushed tortilla chips on top and lots of grated cheese and salsa and chicken. This is my 2016 version of that, the millennial high maintenance, new kid taco salad on the block. And I have so much to say about it – like way more than the large paragraphs of run-on sentences that I just subjected you to for the past minute. First, the dressing! It’s a greek yogurt-chipotle-avocado hybrid thingy. If you don’t love avocado, you can sub in something with high fat, like sour cream or even mayo, just to take away a touch of the yogurt tang. It has a bit of heat too. And you’re going to douse your kale in it. It’s where all the flavor is going to live forever and ever, until it makes it into your mouth. Next! The tortilla strips. I took yellow corn tortillas and simply sliced, seasoned and baked until crunchy and crispy. I know I’ve mentioned before, but if I don’t have homemade ones, I freak out over the la tortilla factory brand – especially the yellow corn. And now baking them until crunchy takes them up another LEVEL. To die for. I could have a meal of those. Then all the regulars. 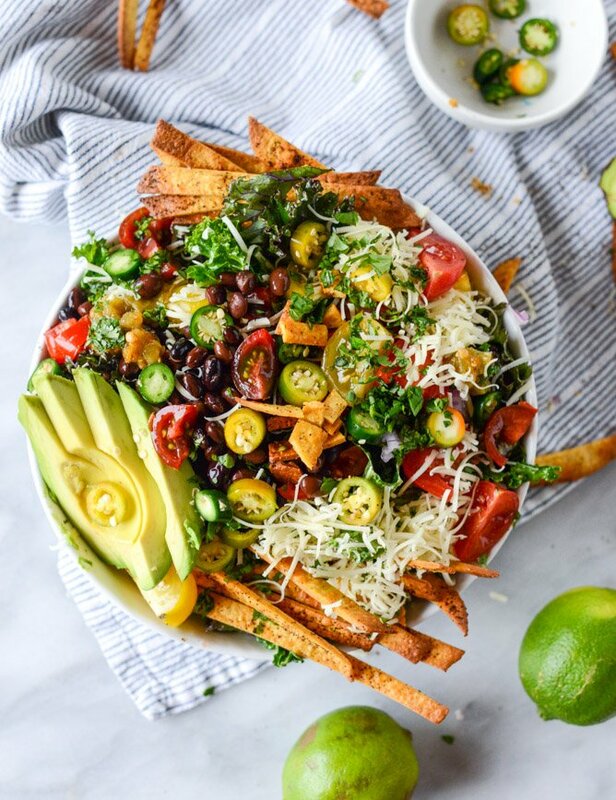 Tomatoes, onion (red or sweet or scallions), more avocado, cheese because hi, have we met?, sliced hot peppers, black beans, salsa and cilantro. I skipped the meat because I just had no need for it. This bowl is so loaded. Eddie on the other hand… we don’t need to go there. You know he’s making chicken for the side. One of the things that I love about a kale salad is that it’s one that can actually hold up and last in the fridge until lunch the next day. And not get gross. You know?? It’s sturdy enough to not wilt and become a terrifying fridge animal twelve hours later. Which means lunch leftovers (or even breakfast, if you’re me) are super easy. Are you with me and declaring today the OFFICIAL start of the new year? Also kind of depressed that the holidays are over but at the same time, like, wow I have my house back from under the glow of glitter and lights and candles that smell like pine needles? Enjoying drinking WATER? But also sort of wanting a glass of champagne? But want to feel all green and good? Life is hard today, I’m with you. Preheat the oven to 400 degrees. Slice the tortillas into 1/4 or 1/2 inch thick strips. Place them on a baking sheet and toss with the olive oil. Sprinkle with chili powder and salt. Bake for 15 to 20 minutes, until crispy and golden brown. While the tortillas are baking, make the dressing. Add all of the ingredients to a food processor or blender and puree until smooth and creamy. Taste and season additionally if needed. You may want more spice, more salt, more smokiness? Add all of the kale to a large bowl. Drizzle it with the olive oil and use your hands to massage the the oil into the kale – you want every leave moistened. Let it sit for 5 minutes. After 5 minutes, take 1/3 cup of the dressing you made and do the same. Drizzle it over the kale and massage. Now build your salad! On go the black beans, tomatoes, diced onion, cheddar cheese, peppers, avocado and cilantro. If you want, you can totally add chicken or steak or tofu or anything else you’d like! This is the kale life. This is sooooo good! I’ve made it 3 times already! My oh my your Salad is just gorgeous!!!! I cant sait to try this recipe. Thanks so much for sharing ? This is one of my new FAVESSS!!! Made it tonight for the family. I tossed the kids in homemade ranch and left off the jalapeños. I also cheated and chopped up a rostisserie chicken because my husband ‘needs’ meat. Haha! He basically drank the dressing – I had some leftover in the blender (I threw in a handful of cilantro because, can anyone ever have too much of that?! NOPE!). Both boys (23mo and 7yo) had two large helpings and my husband ate THREE helpings! So delish. So easy. Such a perfect way to kick of 2018! YUM!!!! My husband and I made this last night, and it was DELICIOUS!! I am looking at my pic of it and, at 7:20am, I want to eat it again right now, LOL. We tweaked the recipe slightly — we’re a family that can’t take a lot of spice, so we left out the adobo sauce and peppers from the dressing and salad. In lieu of making tortilla strips, we just crumbled some leftover hard taco shells we had sitting in the pantry, and we also added some leftover taco meat that we had frozen after our superbowl party. This salad was an AWESOME way to freshen up leftovers and eat healthily while still sneaking a little of the “good stuff” in. Oh, and that lime avocado dressing is amazeballs.